India has lifted restrictions for Bangladeshis from visiting Sikkim and Ladakh. Its high commission in Dhaka has introduced an application form to give permit to those who want to visit those restricted places. 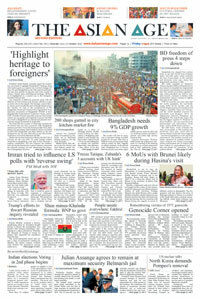 “Yes we have lifted the restrictions,” a spokesperson for the high commission told bdnews24.com when asked about the application form posted on its website. Sikkim is a place in northeast India while Ladakh is a region of Jammu and Kashmir. Earlier, those were among the places where tourists were restricted. Bangladeshis who wanted to visit had to seek permission from New Delhi and were refused in most cases. Now, while applying for visa from Bangladesh, tourists will have to fill out a form and submit it to get the permission for Sikkim and Ladakh. India is the number one destination for Bangladeshi tourists. Last year, about 1.4 million visas were granted from Bangladesh, according to the high commission. This year, the figure will be even higher, it said. The new Indian visa centre located at the Jamuna Future Park is known as the world’s largest visa centre. An official of the State Bank of India which is operating the centre said they are working to get it listed in the Guinness Book of World Records. The high commission in a statement on Tuesday said additional route endorsements on valid visas will now be accepted at all Indian Visa Application Centres (IVAC) across Bangladesh from Thursday. The processing charges of IVAC for this service will be Tk 300. All IVACs will have a separate counter to facilitate submission of applications for route endorsements. An applicant can request for two additional routes, in addition to existing 24 international airports and Gede/Haridaspur rail and road route. The high commission in Dhaka or the assistant high commissions in Chattogram, Rajshahi, Sylhet and Khulna will no longer accept applications for additional route endorsements.